WP Pro Automotive 2 can be used for anything from single dealership sites or build your own AutoTrader.com with the paid front end listing submission system with PayPal integration. Don’t be fooled by others promising clean code and easy customization, I’ve coded this theme from the ground up with customization and ease of use in mind. Auto Loan Calculator – Use this widget to display an auto loan calculator. Dealership Info – Multi – Use this widget to display your dealerships information, automatically pulled from the listings custom fields. Great for multi-dealership or classifieds type sites. Dealership Info – Single – Use this widget to display your dealerships information, manually entered in the widget itself. Great for single dealership sites. Hours of Operation – Use this widget to display your hours of operation. 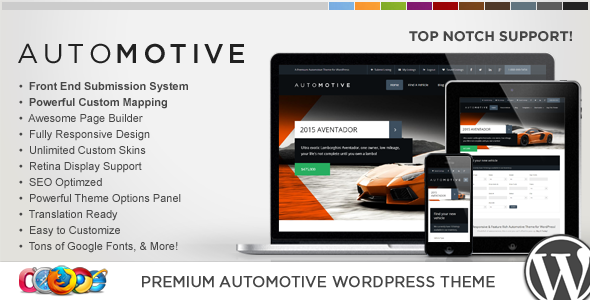 Item Reviewed: WP Pro Automotive 2 Responsive WordPress Theme 9 out of 10 based on 10 ratings. 9 user reviews.